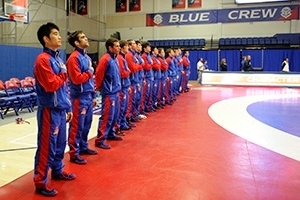 The Eagles wrestling team during the national anthem before a match in Bender Arena. The American University wrestling team attained the third highest GPA among NCAA Division I (DI) programs and earned All-Academic Team status from the National Wrestling Coaches Association. The Eagles finished with a 3.47 team GPA, finishing behind only teams from Harvard and Brown. This marks the ninth time in the past decade that AU has finished among the 10 DI wrestling teams with the highest GPA averages in the nation. They took first place in 2008 and 2009. The wrestling program is committed the success of its athletes on and off the mat. Part of the program’s goal is for team members to earn the highest possible GPA in their field of study, according to head coach Teague Moore. "This commitment is not achieved easily,” Moore said. “These young men have to sacrifice and put in extra hours beyond their time in the classroom, practice room, and competition mat. It is a lifestyle commitment that an AU Wrestler makes." All 10 AU starters were selected as Academic All-Eastern Intercollegiate Wrestling Association (EIWA—the largest wrestling conference in the nation) picks earlier this month. Graduating heavyweight Brett Dempsey also was honored recently as the top AU Senior Male Student-Athlete with the highest GPA across all sports, earning a 3.95 in biology. “Rather, it's a result of a culture that permeates the entire team,” Walker said. “Coach Moore, his staff and most importantly, our wrestlers, put emphasis on and take great pride in the team's academic performance. It's a critical aspect of our program." The team GPA is determined using a system that includes 12 student-athletes from each program. Ten of these came from the wrestlers who were entries in an NCAA tournament conference qualifier. For more information about wrestling and AU’s other men’s and women’s teams, visit www.aueagles.com.